When you are choosing a stairlift from the numerous manufacturers out there how can you tell the good companies from the scoundrels? There has recently been a surge in the number of companies providing stairlifts in Florida and other states. You can choose from stairlift manufacturers trying to do installations as well as distribution or independent factory trained stairlift companies like Florida Stairlifts Inc. or unfortunately untrained start ups working out of homes and garages. Worse yet you could be dealing briefly with a stair lift internet reseller that never touches the stairlift and drop ships the stairlift after payment and evades your telephone calls if a problem occurs. So who should you choose? Well if I was a customer I would want to have a choice of stairlifts make and models so that I can get the stairlift to suit my exact needs. That rules out a stairlift manufacturer as they have to push what they make whether it suits your needs or not they and you have no choice! The manufacturers also tend to have the same or higher prices than the independent dealers. “The factory trained independent stairlift dealer has the capability to offer a chairlift that suits your exact needs”. Stairlift purchases are not made lightly they are always purchased for a real need so the correct product choice is vital. If you choose a local company that routinely serves your area you can expect to get a face to face meeting and service after the sale. (Florida Stairlifts Inc. serves all areas from Tampa, Orlando, Sarasota, St Petersburg, Gainesville, New Port Richey, Palm Harbor, and Tarpon Springs etc.). If you choose to buy from an internet box shifter out of North Carolina or Chicago how focused do you think they will be if a problem occurs after they have your hard earned money. Weeding out the scoundrels! Initially ensure you do your due diligence on researching your shortlisted stairlift suppliers. At a minimum ask for references from past customers. A refusal is often telling enough. Ask privately if the stair lift company did a good job, offered to service the lift in the future and how responsive the company was when needed. Use other consumer resources such as “Angies List” or “Google” the company name. Check if the company lists their business address on their website and promotional literature. I personally don’t do business with companies that hide where they do business from! Come and visit Florida Stairlifts Inc. whenever you wish. Ask to see proof of liability insurance and valid business licenses. The “fly by Night Company” doesn’t choose to bother with these formalities. What type of warranty do I need, life time warranties? Equipment and parts warranty, expect a minimum of 2 years (excluding batteries). Labor repair warranty, expect a minimum of one year. The parts or equipment warranty is normally offered by the stairlift manufacturer and physically honored by a licensed dealer or distributor. You should expect 2 years on parts any less is an indication of expensive repairs in the near future. Lifetime warranties do exist but are normally “limited” to motors and gearboxes alone. Manufacturers can offer lifetime warrantee on motor and gearbox as these are the most reliable parts of the lift system in most designs. Just don’t be fooled into thinking you are getting a “lifetime warrantee on all parts” ask exactly what is covered to avoid unpleasant surprises later. The labor warrantee is typically supplied by the installation company and can vary from the day of installation to one or two years. The labor warrantee is only as good as the company backing it. Ask how long the business has been operating solely supplying stairlifts and check for service complaints. Will my stairlift installation company maintain and service my lift in the future? Certainly ask this question because the answer may surprise you. Many stairlift distribution companies will not repair or service equipment they installed let alone other companies star lift installations as there is not enough profit in the service work. Reputable companies will always commit to after sales maintenance and service. When Do I Need a Heavy Duty Stairlift and what is the difference? Heavy duty stairlifts are often sold as an “up sell” item an honest stairlift supplier will only offer you “options” if you really need them now or in the future. Typically most straight stairlifts have a weight capacity of 300lbs. Curving rail stairlifts typically are limited to 265lbs user capacity. One unscrupulous manufacturer sells its “heavy duty” stairlift at a premium price of between $300 and $800 and the only difference is a sticker applied at the time of installation. A genuine heavy duty model will tell you what the rated user capacity is, will have a motor rated to carry the passenger capacity, supporting structures with the capacity to maintain the appropriate safety factors and have a seat that is larger to accommodate a larger person. Often the chair assembly has a wider distance between the arms than a standard seat but the seat pad remains the same width ask if this is the case before you buy. As always its buyer beware with the purchase of a stairlift whether it’s straight, curved, inside your home or outside. Where ever possible talk with your supplier hopefully a n independent, factory trained company such as us “Florida Stairlifts Inc.” Find out what product suits your budget and exact needs for now and the future. Ensure you are comparing apples with apples and this includes stairlift safety features, drive type, power source, labor warrantee, parts warrantee and after sales service. You need to know what the total cost of stair lift ownership is before you buy, choose carefully. Florida stairlifts Inc. would be pleased to discuss your stairlift needs at your convenience. We offer Stannah Stairlifts, Sterling Stairlifts by Handicare, Summitt Harmar lifts, MediTek Stairlifts, Bruno Independent Living Aids equipment as well as used Acorn Stairlifts if requested. 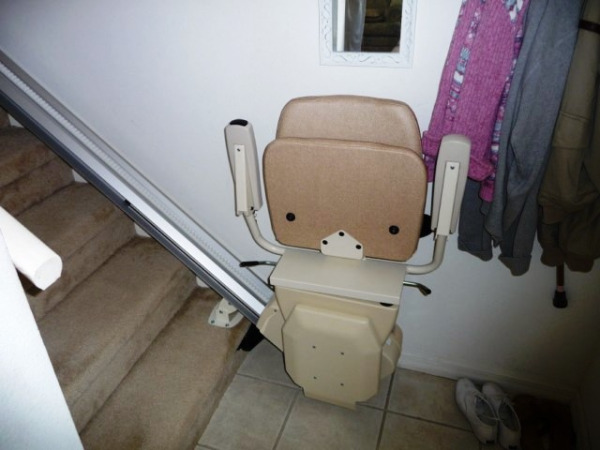 Is DIY Stairlift Installation Safe? © 2015 Florida Stairlifts, Inc. All rights reserved.